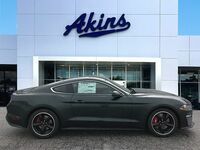 With both models offering a fun drive and aggressive physique, the 2019 Ford Mustang and the 2019 Subaru BRZ are two common options for those looking for an adrenalizing drive at an affordable price. With the BRZ still rolling through its first generation, does this Subaru sports vehicle have what it takes to compete with the Mustang and its rich racing heritage? Find out in this side-by-side comparison of the 2019 Ford Mustang and the 2019 Subaru BRZ. The Mustang and the BRZ are similar in their 4-seat configurations, but the space each passenger enjoys differs between the two models. Overall, the Mustang Fastback offers 82.8 cubic feet of passenger space. The BRZ’s cabin comes more cramped with just 76.5 cubic feet of passenger space. This 6.3-cubic-foot gap in total passenger space translates to .5 inches more headroom, 1.8 inches more shoulder and hip room and 3.2 inches more legroom for those riding in the front seats. In the rear seats, it means 2.1 inches more hip room and .5 inches more shoulder room. 350 - 429 lb.-ft. Torque 151 lb.-ft.
For sports car enthusiasts, engine diversity and performance are some crucial points of consideration. A major distinction between the 2019 Ford Mustang and the 2019 Subaru BRZ is the quality of their engine lineups. The 2019 Mustang brings three engines to choose from: the 2.3-liter turbocharged engine, the 5.0-liter V8 and the 5.2-liter V8. Offering just one 2.0-liter DOHC engine across all trim levels, the Subaru BRZ’s engine lineup isn’t much of a lineup at all. Even at the base level, the Mustang has the BRZ beat in engine performance. Both models offer a 6-speed manual transmission, but the Mustang is the only one to bring in an optional 10-speed automatic transmission.